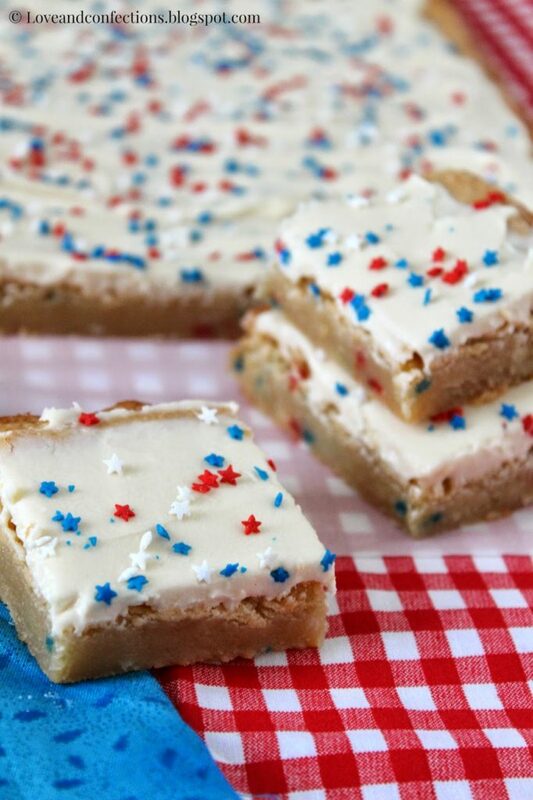 White Chocolate Blondies with White Chocolate Frosting are a great dessert for a last-minute party invite. You can customize the sprinkles for any occasion too! If you need a quick dessert recipe, these are your go-to bars. 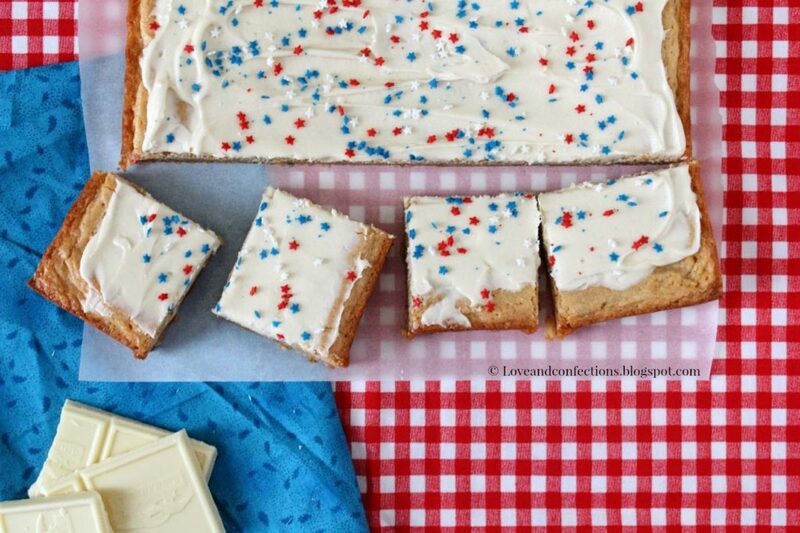 They are simple to make, bake in 30 minutes, and the frosting can be made while the blondies cool. I absolutely love my mini star sprinkles, but who doesn’t love sprinkles. 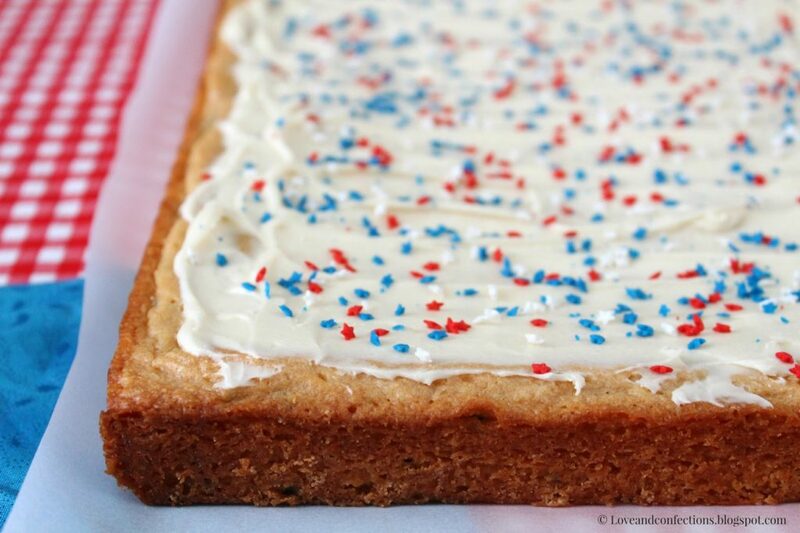 Sprinkles make every baked good better, in my opinion. This Independence Day, I will be having a barbecue and pool party with the family. Baby L&C will be decked out in her adorable red, white and blue outfit, and of course she has a cute bathing suit and float for the pool. I love grilling outdoors and grilling with family and friends is one of the best parts of Summer. If you need any good grilling recipes for this weekend, check out my friend, Kim’s site – Kiss My Smoke. This will be Baby L&C’s first 4th of July. Here’s hoping that the fireworks don’t freak her out. Granted, she can sleep through a lot, but I’m still hoping there aren’t any idiots and/or drunks patriotic party-goers setting off fireworks at our apartment complex at midnight (crossing fingers). 1. Heat the oven to 350°F. 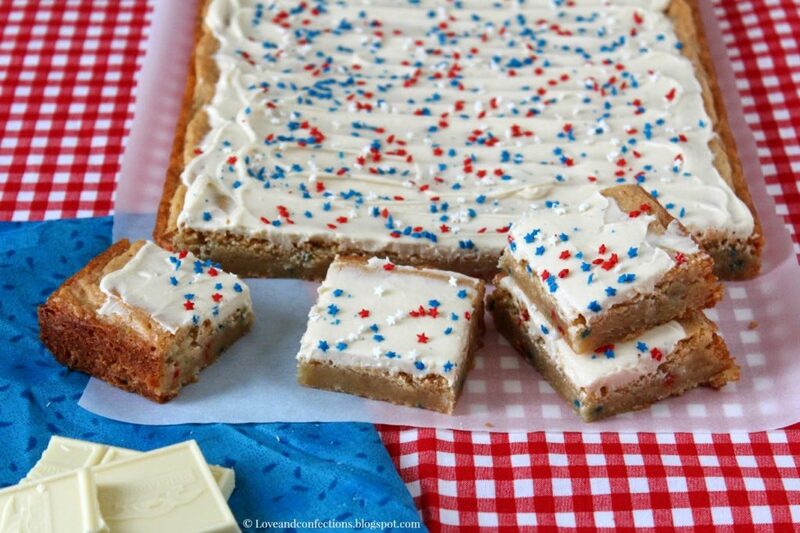 Prepare a 9×13 baking pan with parchment paper and baking spray (leaving an overhand so you can get the blondies out easily). 2. In a small saucepan, melt the Butter and White Baking Chocolate until there are no lumps, stirring frequently so it doesn’t burn. 3. In the bowl of your stand mixer or a medium bowl with a hand mixer, add the Butter/Chocolate mixture, Brown Sugar, Granulated Sugar, Eggs, Vanilla Extract and Salt. Blend until combined. 4. Add in the Flour, one cup at a time and the Milk. Mix to combine. 5. Add the Sprinkles and mix by hand with a spatula. Pour into pan and bake for 30-35 minutes, or until a toothpick inserted in the center comes out clean. 6. Cool in pan for 10 minutes, then using the parchment paper, remove from pan and cool on wire rack. Frost when cool (optional). 1. Melt White Baking Chocolate in a microwave-safe bowl for 20 second intervals, stirring after each round in the microwave. 2. In a small bowl, mix the White Chocolate, Butter, Vanilla Extract and Salt until combined. * for a whiter frosting, use clear vanilla extract – although it will not be completely white because of the color of butter and white chocolate. Thanks Stephanie! Happy 4th of July to you and your family too! I could hardly pay attention to the recipe. 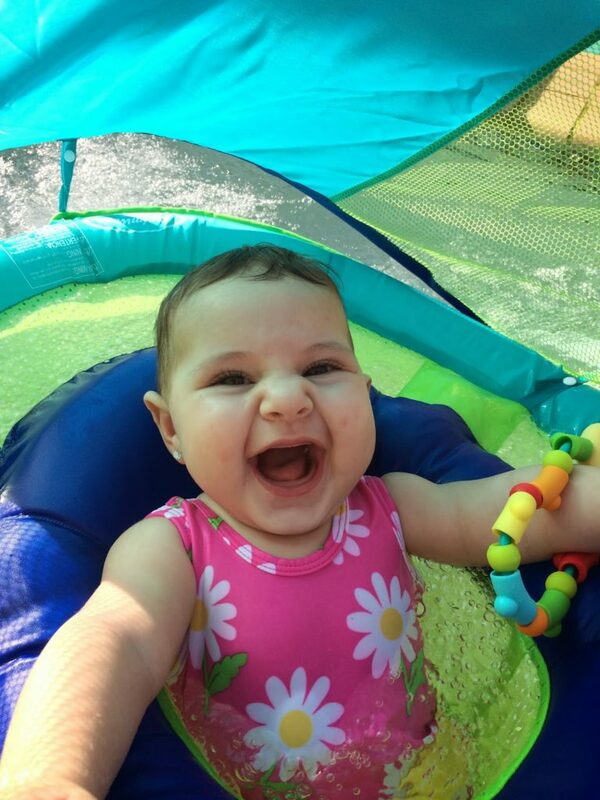 That is the happiest Baby picture I have seen in a long time. Oh my goodness. What a sweetie in her darling flowery bathing costume. The recipe looks like a winner too, by the way. Lol. Thanks Carol. She is such a sweetheart! And she always smiles big. So fun, delicious looking and SO pretty! Thank you Chris! Means a lot coming from you.